: Dr. Mark Torchia and engineer Richard Tyc designed The NeuroBlate System which uses a laser-probe inserted into the brain through a small incision in the skull to heat and kill tumour cells. Acute otitis media is one of the most commonly treated bacterial infections in children. A U.S. estimate says it accounts for more than half of the pediatric antibiotic prescriptions. And 25 per cent of those prescriptions are thought to be unnecessary. “Unfortunately, for a variety of reasons, otoscopy remains one of the most poorly taught medical skills world-wide,” says Dr. Vito Forte, co-inventor of OtoSim, a simulation device used to teach ear examinations. Ear ailments cost health care systems a lot of money (10 million in Canada in 2011) because they account for a significant number of doctor visits. And many are misdiagnosed. By improving the teaching of a medical skill, OtoSim is solving a problem that has an important health business case. Dr. Forte did much of the development for the OtoSim outside of his day job as the chief of otolaryngology-head and neck surgery at SickKids. He’s part of a wave of entrepreneurs whose experience in healthcare – specifically in hospital – is allowing new ideas and inventions to change a system in need of fresh approaches. OtoSim, which is now sold to more than 100 institutions in over a dozen countries, is an ‘invented here’ technology. And there are more, but their number is less than one would expect in a country whose health system needs #innovation to ensure sustainability under the pressure of tighter budgets and a growing demand for services. Canadian hospitals’ willingness to get into the innovation game was chronicled in last year’s report from the Advisory Panel on Healthcare Innovation, led by David Naylor. The report also identified a number of ways in which the public sector supported innovation in healthcare, citing examples like B.C.’s Innovation and Change Agenda introduced in 2009, and Alberta Innovates – Health Solutions, which coordinates, funds and supports health research in that province. Ontario took things a step further last year by following the Ontario Health Innovation Council’s recommendation and creating an office of the chief health care innovator. The council’s report recognized that most Ontario innovators faced significant challenges connecting with clinicians, patients and buyers to develop new solutions. Having a leader assigned to coordinate among key players and resources could help remove some of these barriers. As North America’s third-largest hub for biotech and the fourth largest biomedical research centre, Ontario has the capacity for more innovation. Its medical devices sector, for example, employs more than 17,000 people in 900 manufacturing firms, accounting for 49 per cent of total Canadian medical devices employment. But the Conference Board of Canada says that despite more than a decade of innovation agendas and prosperity reports, Canada remains near the bottom of its peer group on innovation in general, ranking 13th among the 16 peer countries. “It’s not that the technology doesn’t exist,” says Dr. Trevor Jamieson, a researcher for WIHV, an institute at Women’s College Hospital working to promote and expand virtual care in Ontario. “There are lots of things that exist already and work well. It’s the logistical and bureaucratic issues that keep it from getting into healthcare.” While entrepreneurs know that there is money to be made in healthcare, some are scared off by the thought that the only viable customer for their product may be the government or a LHIN, he explains. Canada is probably close to 10 years behind its leading peer jurisdictions when it comes to health care innovation, offers Zayna Khayat, lead of health systems innovation at MaRS Discovery District and director of the Excellence in Clinical Innovation Technology Evaluation (EXCITE) program at MaRS in Toronto. But Khayat is encouraged by what she sees and meets regularly with hospitals to discuss innovation. Whether it’s a department, a unit or a person made responsible for innovation, she says hospitals are charging ahead on the innovation agenda. “They’re all doing it and it’s important to recognize that that is not their primary role,” says Khayat. Relative to the everyday work of delivering patient care, developing innovations and changing systems can easily become a secondary concern. But she says there is broad recognition in the sector of the importance of innovation and that the scarcity of funding is prompting many hospitals to consider what they could do differently. And that thinking takes different forms. In Ontario, for example, Khayat has observed four different types of innovation plays. Emerging bio clusters like the one Windsor recently announced align the interests of Windsor Hospital with WindsorEssex Economic Development Corporation to leverage the city’s access to Detroit hospitals and the potentially massive U.S. health care market. Then there are different types of in-house innovation cells like the three under Toronto’s University Health Network umbrella: OpenLab uses a wide lens to rethink the health system’s user experience while the Techna Institute has $10 million in funding and over 50 researchers focused on designing and engineering breakthrough medical technologies. The Global Centre for eHealth Innovation, focuses on digital health technologies targeted towards both clinicians and empowered patients. Other hospitals act as living labs. Mackenzie Health in Richmond Hill has a 34-bed innovation unit featuring smart beds and smart badges, it partners with large health technology vendors (including Blackberry) to test and implement leading edge technology it can scale to the rest of the hospital. Another play is to use the hospital to help incubate and springboard local technology startups to ultimately spur the local health economy. That’s what Southlake Regional Health Centre in Newmarket, Ontario had in mind when it launched its Create IT incubator in October of last year in partnership with the Town of Newmarket, ventureLAB, Seneca College, York University, and York Region. According to Southlake, as many as 90 per cent of health care start-ups fail in large part because they can’t break through the barrier of access to the healthcare system while developing their products. Gary Ryan, Southlake’s chief innovation officer says a typical start-up is challenged by hurdles like finding a hospital willing to test the product and finding an academic researcher to design a study to validate it. Southlake wants to speed up the process. “If you didn’t have all these resources in one space it could take up to a year to accomplish what you could do here in three months,” says Ryan. Located on the Southlake campus just steps from the hospital’s main building, the 4,000-square-foot space can house programmers from up to two dozen start-ups who act as an on-the-ground presence for companies conducting clinical trials. The hospital itself is a major economic player in the region, and the hope is that it could drive regional economic growth by building companies that provide hospitals with technologies and services. “So that it’s not the hospital but the health care sector that can help to drive the local economy,” says Ryan. Given that billions of dollars are spent on healthcare across the country, he explains, the larger vision for this initiative is to help some of those dollars stay in Canada, if not in the York Region. While providing a direct connection to a hospital has distinct advantages, Jennifer Diakiw, president of the Calgary-based Manning Innovation Awards sees innovation as a national imperative. Three of the Manning foundation’s four awards this year were for innovations designed to improve health care – included among them are Dr. Forte’s OtoSim; the NeuroBlate, a tumour-destroying laser probe; and CleanPatch, a low-cost repair patch for damaged hospital mattresses. “We know from research that innovation is intrinsically motivated, but if you surround yourself with a community of innovators, you’re much more likely to succeed,” she says, adding that the foundation’s aim has always been to showcase Canadian inventions – specifically that have been commercialized – and to make innovators into celebrities. “That’s one of the most effective ways of creating a culture of innovation,” she says. Hospitals often use the word innovation to describe a change in process or a better way of doing things. But there’s a natural force in the evolution of any workplace to adopt efficiencies and champion improvements. A much more concise definition of innovation in hospitals should also be considered -one that describes the devices and the policies that respond not only to the system challenges, but make a broad contribution to better care. Hospitals are demonstrating an important commitment to understanding how they define innovation. While the health system changes Canada requires may be dictated by outside influences, the changes must come from within. And each effort to champion innovation will itself become an influence for change. The NeuroBlate System uses a laser-probe inserted into the brain through a small incision in the skull to heat and kill tumour cells. The device, designed by Dr. Mark Torchia and engineer Richard Tyc, allows for a minimally invasive procedure that is conducted in an MRI machine. This enables surgeons to plan, steer and adjust the laser continuously as it is delivered. It also increases precision in ablating the lesion and avoids damaging surrounding healthy brain tissue. With this technique, patients are often able to leave the hospital a day or two after surgery with a minimal amount of post-procedure pain. Tyc attended a case where the patient left the operating table minutes after the laser ablation to go to the bathroom unattended. “I couldn’t believe we’d just performed a treatment on this patient and she was able to just get up and walk away,” he says. “Early on, we identified a patient population that wasn’t being served, and we knew we had to innovate and be unique. Laser therapy itself wasn’t new but when we first started working with the laser probe, we found that simply sticking a laser fiber into tissue and firing it wasn’t really giving us results we needed. It didn’t give the control the surgeon needed to treat a unique area like the brain,” he says. But the side-fire, cooled-probe technology the duo developed did offer control. And the NeuroBlate technology is the only commercial actively cooled side-fire laser probe with integrated magnetic resonance guidance on the market, says Tyc. 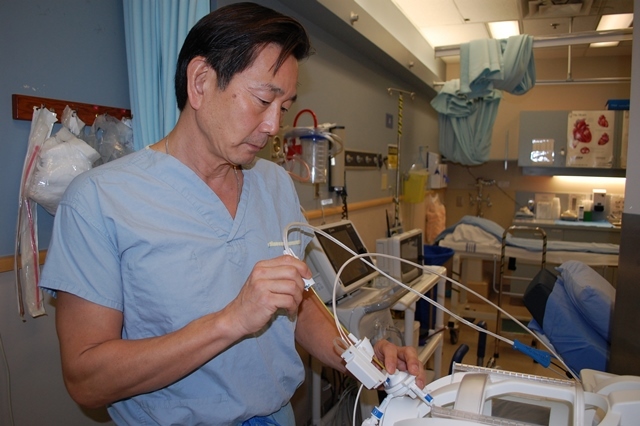 Dr. Torchia, an associate professor of surgery in the University of Manitoba’s Faculty of Medicine, conceived the first prototype for NeuroBlate in 1990 while working at Winnipeg’s St. Boniface Hospital. He brought Mr. Tyc on board in 1999 as the first full-time employee to help develop the technology application and turn the concept into a viable commercial product. The duo later founded Monteris Medical Inc. to manufacture and distribute the NeuroBlate System. It is now being used to treat patients in over 30 U.S. hospitals and has received Health Canada approval for use in Canadian hospitals. Torchia and Tyc received the largest ($100,000) of several prizes the Ernest C. Manning Foundation awards annually to Canadian innovators who are improving the lives of Canadians and others worldwide through their commercialized innovations. 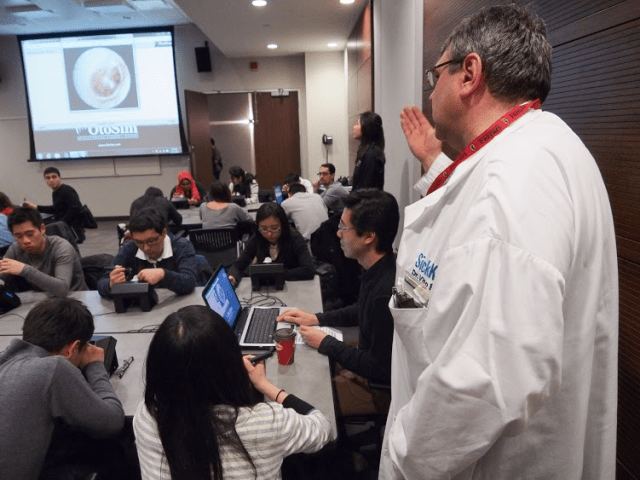 Dr. Vito Forte, a surgeon at Toronto’s Hospital for Sick Children developed the OtoSim, an otoscopic training tools for students and medical professionals. The ability to perform an ear exam, or otoscopy, is one of the most poorly acquired medical skills, according to Dr. Vito Forte, a surgeon at Toronto’s Hospital for Sick Children. It’s also one of the hardest to teach because the ear drum is so tiny and the exam can be painful for the patient if not done properly. There’s little time reserved for acquiring this vital skill in an already jam-packed medical school curriculum, he says and students aren’t given time to examine patients in busy training clinics. “This results in doctors making incorrect diagnoses, over-prescribing antibiotics, and making unnecessary referrals to specialists. It puts an overall burden on the health care system,” he says. Dr. Forte, who is also a professor in the University of Toronto’s Department of Otolaryngology, and his colleague Dr. Paolo Campisi saw a systemic need for better otoscopic training tools for students and medical professionals they taught. Working with a multi-disciplinary team of clinicians, educators, and engineers, Dr. Forte created the OtoSim system. It’s a silicone ear made to scale with an integrated computer display of images of the ear canal and eardrum exhibiting a full range of medical conditions. Students use it to mimic the experience of looking into an ear with an otoscope. OtoSim training units can be networked in sets, allowing instructors to share images with a group of students, and electronically point to areas within images to confirm that students are accurately seeing different pathologies or anatomical landmarks. OtoSim-based training can also be done remotely through the Internet. Studies on the tool’s use have found that medical students trained with OtoSim increase their diagnostic accuracy by 44 per cent. To date the training tool has been purchased by more than 100 institutions in over a dozen countries. Dr. Forte won a $10,000 prize from the Ernest C. #Manning Awards Foundation. 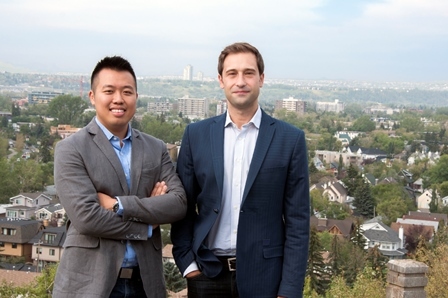 Fabrizio Chiacchia and Iwain Lam (left) and Fabrizio Chiacchia (right) invented the CleanPatch, an adhesive film designed as a preventative, early-stage maintenance tool for torn mattresses and stretchers. When a relative told him about a discussion with his chiropractor on the high cost of replacing a damaged treatment table, Calgary-based Fabrizio Chiacchia began to consider all the damaged beds a hospital might need to replace. His initial research found that 47 per cent of beds in one health care facility alone had damage and a number of them had a pathogen that could cause a hospital-acquired infection. Chiacchia, who has a background in business and biotechnology, formed Surface Medical Inc. with several partners to address the problem and hired Iwain Lam to help with product development. Health Canada estimates that 220,000 people a year pick up infections at health care facilities. Hospital-acquired infections (HAI) are responsible for as many as 12,000 deaths and $1 billion in health care costs annually. “There’s good evidence that shows that damaged or contaminated mattresses result in the transmission of disease. The medical literature goes even further to show that if you can replace or restore those surfaces to an intact state, then you can actually stop an outbreak or reduce the transmission of those diseases. The reality is that buying new mattresses every time there is damage is not viable with current health care budgets,” he explains. Chiacchia and Lam worked through hundreds of prototypes of varying materials to develop CleanPatch, an adhesive film designed as a preventative, early-stage maintenance tool. 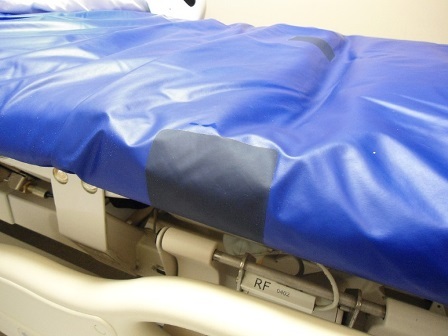 It can be easily applied to torn mattresses and stretchers to extend their use and prevent contamination. CleanPatches are priced at roughly a twentieth of the cost of a new mattress and are now being used by hundreds of hospitals in seven countries. This fall, the duo accepted a $10,000 prize from Calgary’s Ernest C Manning Innovation Awards, a foundation established in 1980 to recognize and celebrate Canadian innovators. “A lot of people have good ideas, but actually executing them, takes work, takes risk and we have been fortunate to have support along the way,” says Mr. Lam, adding that he and Mr. Chiacchia hope CleanPatch is only the first is a long line of affordable products developed by Surface Medical to help to reduce hospital-acquired infections.